Click on the photo and see all the photos of Hostal Plaza Las Banderas. WiFi available in all areas, 24-hour front desk, Safety deposit box, Tour desk, Luggage storage, Private check-in/check-out, Terrace, Laundry, Trouser press, Daily maid service, Non-smoking rooms, Family rooms, Heating, Non-smoking throughout, Designated smoking area. Only a 10-minute walk from the main square, Hostal Plaza Las Banderas offers rooms with free Wi-Fi and heating in Temuco. Free parking is provided. Dreams Casino is 300 metres away. Decorated with contemporary painting, the cosy rooms at Hostal Plaza Las Banderas are fitted with private bathrooms and cable TV. This property is run by its owners and serves a daily breakfast. A common living room with a TV set is featured on site. 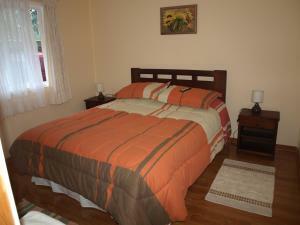 Hostal Plaza Las Banderas is 4 km from the bus terminal and 200 metres from Portal Temuco shopping centre.